It’s never easy to farewell a champion, especially one as wonderful and as enduring as Winx. But as the world prepares for the end of an era, there’s another way to celebrate the memory of wonderful Winx ... with a glorious Winx Rose produced in her honour. In a wonderful gesture of support, Winx’s owners have selected the National Jockeys Trust as the nominated charity to receive a $1 donation for every Winx Rose sold. The Winx Rose can be pre-ordered online. The astonishing Winx has strung together an extraordinary 32 consecutive wins over four years—a world record 24 at Group 1 level—and will farewell the racetrack in the $4 million G1 Queen Elizabeth Stakes (2000m) at Randwick on April 13. Her amazing record stands at 42 starts, 36 wins, 3 seconds and $24,016,674 in prizemoney. She has won at distances from 1100 metres to 2200 metres, during which time she has been cared for meticulously and always with her welfare of paramount importance by her trainer Chris Waller, his staff and jockey Hugh Bowman. There is only one more, emotional, soul-stirring race to come. We have built a remarkable catalogue of incredible memories of Winx’s spine-tingling performances that have etched her name alongside legends such as Phar Lap, Carbine, Makybe Diva and Black Caviar as one the greats of the Australian turf—and arguably the best of them all. Winx’s connections – Peter and Patty Tighe, Richard Treweeke and Debbie Kepitis - have combined with Knight’s Roses to produce a unique commemorative rose in Winx’s honour. The Winx Rose, like the great mare, is the epitome of class. This beautiful flower is the product of exquisite breeding designed to capture the qualities that define Winx—elegance, longevity and brilliance. Just as Winx is a once-in-a-lifetime horse, the Winx Rose is a fittingly unique tribute to the world’s best racehorse. “The Winx Rose is a very special way to recognise Winx’s achievements. As owners we are incredibly proud of Winx and humbled by the support and love from her fans around the world. We are excited to have worked with Knight’s Roses to produce a lovely memento to allow fans to celebrate our wonderful mare. Like her, it’s beautiful.” said Patty Tighe on behalf of the Winx owners. 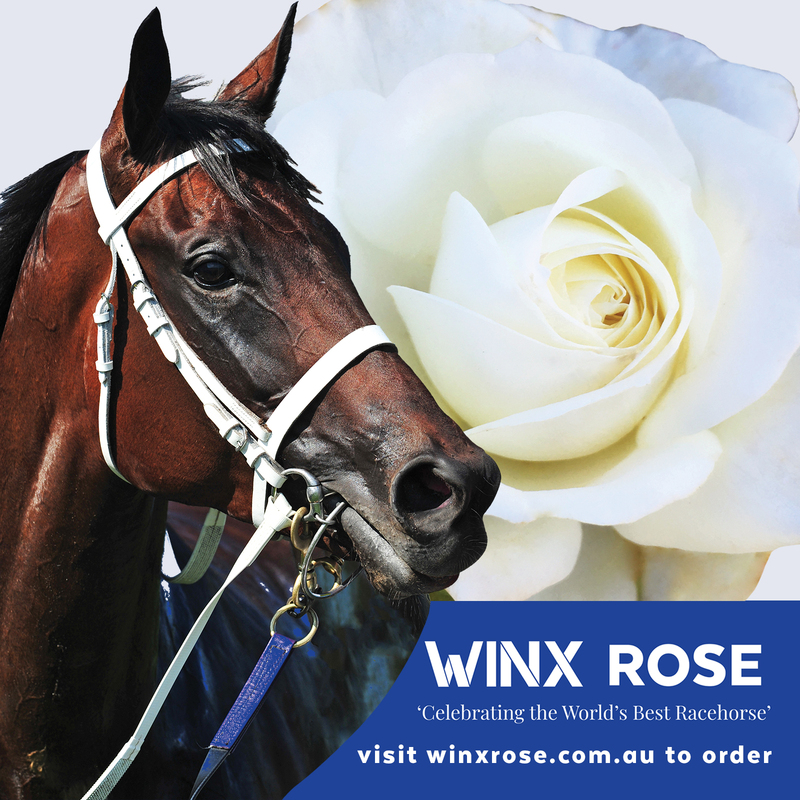 The Winx Rose, a commemorative boxed bare root can be ordered online at winxrose.com.au and will be available at selected nurseries for RRP $26.00. Bare root roses will be dispatched in May. Potted roses will be available in Spring. Knight’s Roses is a family-owned and operated company with a long and proud history dating back over 50 years. From humble beginnings, the South Australian company has flourished to become one of the largest rose suppliers in Australia. Knight’s is located in Gawler, the gateway to the Barossa Valley. Knight’s Roses is proud to present a collection of stunning commemorative roses, with part proceeds from the sale of these roses being donated to the nominated charity of each special cause rose. These include the Black Caviar Rose; Variety Rose, Firestar – supporting CFS Foundation; Daniel Morcombe Rose, Peter Brock Foundation Rose, South Australian Country Women’s Association (SACWA) Rose and Dolly’s Dream Rose. Why is the Winx Rose white and not the famous blue (with white M) of the colours worn by Winx’s jockey Hugh Bowman? * The Winx Rose is an officially licensed Winx product; via Knight’s Roses in South Australia.